During analysis, your selections are displayed above the sheet. Each selection item has a small bar at the bottom that reflects the selection states for that dimension. Three states are displayed in the bars: selected (green), alternative (light gray), and excluded (dark gray). Locked values are indicated by a lock icon. Selections bar with the selections Year, Product Group and Region made. Region is locked. Note: When an app is saved using Qlik Sense, the current selections and locks are not saved. Selections and locks must be made every time the app is opened. Selection Region with selection pop-up menu. If you use alternate states in the app, you can see selections that are made in the states in the selection bar. The field that is used in the state is displayed with the number of alternate states. 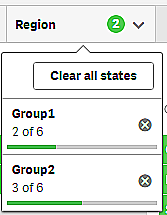 You can click on the field to show the states, and then click on a state to see the selections. You can also clear the selections of a state or clear all selections. For more information, see Using alternate states for comparative analysis. Selection Region with alternate state pop-up menu for the states Group1 and Group2. All values are selected (marked ). Alternative values change state to selected (green). Excluded values change state to selected excluded. They are still dark gray, but are now selected (marked ). If you clear the selections that made these values excluded, they will change state to selected (green). All possible values (white) are selected. 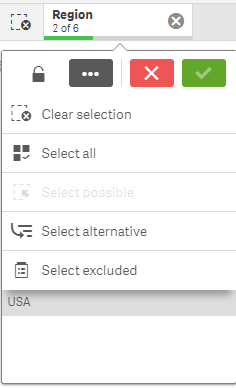 This option is never available in the selections item, because when a selection is made, the other values are either alternative or excluded. In a filter pane, however, you can have possible values as a result of another selection. When a selection has already been made in a field, alternative values, when present, have a light gray color. These are values that would have been possible values (white), if a selection had not already been made in that field. By selecting alternative values, the values that previously were selected become alternative. If there are alternative values, they will be selected (green) and the values that previously were selected will change state to alternative. Excluded values will change state to excluded. If there are no alternative values, the excluded values are selected (green), and the previously selected values change state to alternative.